We had a fun weekend. Olivia spent the night with Lovey and Daddy Doc Friday night and went to the play Rumpelstiltskin at the Children's theater Saturday morning! Mom told me the made it nicer than the original. The only part I remembered of the story was when the troll wanted to steal the baby - scary! But she had fun. 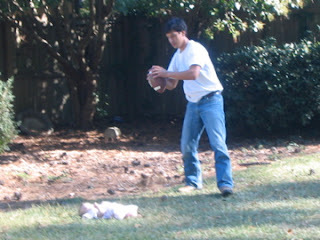 Then they dropped her off at our friend's house where we watched the Ole Miss game!!! We played ALL DAY outside and even walked to go and get ice cream ::mmmm Bruster's:: after the HORRIBLE call by the ref in the Ole Miss vs. Alabama game in the last 7 seconds! Crazy!! But it was a beautiful day! At one point, I asked Robert to watch the baby while I did something like help clean up. So.........this is his idea of "watching the baby". He just SET HER DOWN!!! HAHA!!! Don't worry, I went right over and picked her up. She wasn't even fussing. She really enjoys the fresh air! Needless to say, they all needed baths when we got home so they would be clean for church in the morning. It's not the greatest picture - but it is the first picture of bath time with all 3 in the tub! So much easier dragging the baby tub out, setting it in the sink, messing up two areas, dripping water off when you put it away....you get the picture. I think she liked it. And Olivia held her up when I washed her. It was great! Non of them look too thrilled. But like I said, they played so hard, went to bed early last night, and slept great from being so worn out!! Well, I'm starting off this week with a fast or something. I was SO bad this weekend. I ate a WHOLE slice of COOKIE DOUGH cheesecake from Cheesecake Factory Friday night. And then had a huge bowl of CAKE BATTER ice cream with COOKIE DOUGH topping from Bruster's on Saturday - can we say......... CALORIES!! We won't even count the Mexican food and margarita! :-) HA! Good Gosh! I think I'm regretting canceling my gym membership. I guess I'll just have to nurse it off! hehehe The modern day liposuction! Most weeks, I do really well eating wise. And then I have those times where I just don't care! Oh well, we can all be bad every once in a while....but that was BAAAADDDDDD. Sounds like my kind of weekend: a night with a tiny break from one of your kids, a day of football, Cheesecake factory, cake batter ice cream (LOVE IT! ), and Mexican food. Does it get much better?! If I were you, I wouldn't fret too much about all the calories you consumed. You are such a tiny thing, you need a vacation from calorie counting! Enjoy it! You can afford to eat what you want. Now me on the other hand, I still eat what I want and then complain to Ashley that my tummy won't go away. Doesn't make much sense, does it? What a fun weekend! I love the pictures. I am in shock that you cancelled your gym membership!!! WOW! That bathtub picture is so cute! Lindsay, give yourself a break. Maybe you ate so many calories because your body NEEDED THEM. You are TINY so don't stress!! 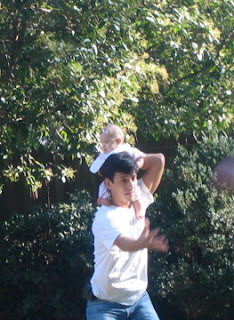 Oh, BTW, I love Robert playing football with Lilian on his shoulders. Typical dad! Too cute!!! She just fits right in. LOVE IT!! ROBERT MCCLELLAN YOU BETTER NOT DROP MY BABY!!!!! Sorry for your loss - Ole Miss game. :( Annie is way more of a fan than I expected. She is really had me laughing lately with all of her football comments. Such fun, isn't it? ?